Wang Huaiqing, (born Beijing, 1944), arguably the finest living painter in China today, recently completed several series of etchings based on his larger scale oils. 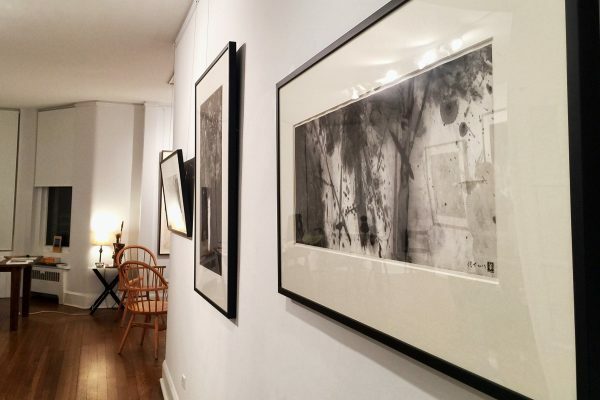 The exhibition showcases his newest etchings, printed in Barcelona under his supervision. Wang silhouettes everyday objects and animates them in space. The bold figurative elements are shorthand versions of Chinese classical furniture, archaic bronzes and porcelain vases. Flat black shapes are placed against the void, much like Matisse cutouts; but there is no mistaking their Chinese origins. Wang’s genius is in his playful animation of two dimensions and the allegorical inference of Chinese traditional objects. In 1956, Wang passed the entry examination to study at the Central Academy of Fine Arts (CAFA) High School in Beijing but his schooling was interrupted by the Cultural Revolution. He and his CAFA classmates were sent to the countryside to work for subsistence farmers in northwest China. Wang does not dwell on this period with regret. In his indomitable optimism, Wang commented, ”We were young and eager to experience life. In spite of the difficult living conditions, I gained a deep appreciation for Nature and the traditions of Chinese agrarian society. I feel lucky to have had such an immersion during the formative stages of my artistic development.” During this period, Wang designed numerous political posters, many of which were included in an exhibition at the Asia Society in New York in 2008. The Soviet-realist-based style in these earlier works foretells the graphic genius in Wang’s mature work. Finally admitted to the graduate program at CAFA in 1979, Wang painted with oil on canvas in a realistic Western style full of allegorical meaning. As part of an emerging group of talented artists, “The Contemporaries,” Wang sought beauty and art in the everyday. In the mid-1980’s Wang branched out stylistically and garnered numerous national painting awards. Around that time, Wang was profoundly influenced by a sketching trip to eastern China, in the region around Shaoxing where the traditional architecture is dominated by white washed stucco walls and black tile roofs. Wang was struck by the juxtaposition of the simple black and white buildings, and the intrinsic “Chinese-ness” of the shapes. 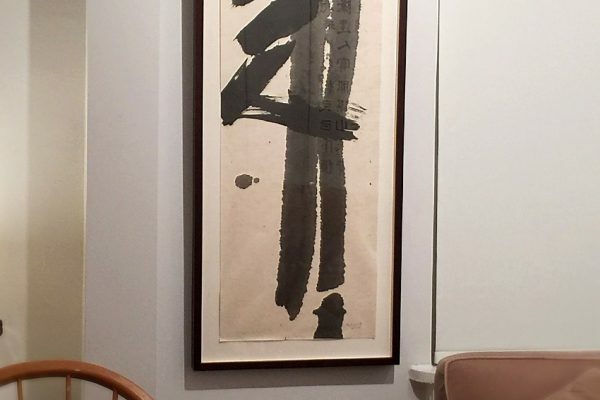 His painting palette became heavily dependent on black, white and grey in the 1980’s, echoing the interplay between form and negative space in Chinese calligraphy. The bold, black forms in this current exhibition may remind a Western viewer of Matisse’ “Jazz Suite.” In the two “Families” series on view, Wang arranged soot-black shapes against the bare paper, based on silhouettes of archaic bronze tripods, vases and bowls to create bold, near-abstract compositions. The connecting drips of the printing ink recall Chinese calligraphy cursive script. Wang introduced bold color in his work from time to time, such as the cinnabar red of the background of “Peace.” Wang was not only influenced by Chan Buddhist ideas of space and void, but after travelling to the United States, he was deeply impressed by Minimalist artists such as Giorgio Morandi and Sol Lewitt. This exhibition reveals the full expressive powers of this Chinese master. 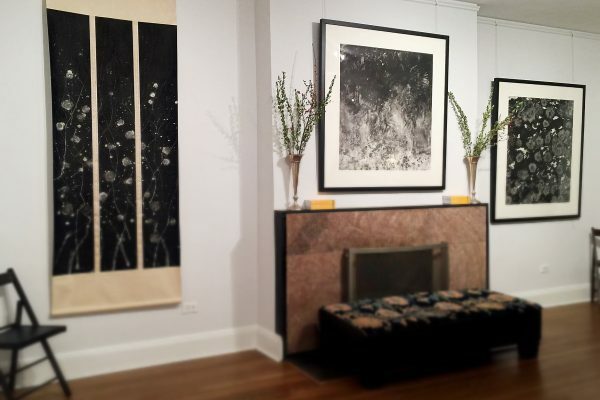 M. Sutherland Fine Arts is pleased to present these prints, along with selected works by other artists represented by the gallery for AsiaWeek March 2019. The exhibition will continue after AsiaWeek (ends March 23) by appointment only until April 26. 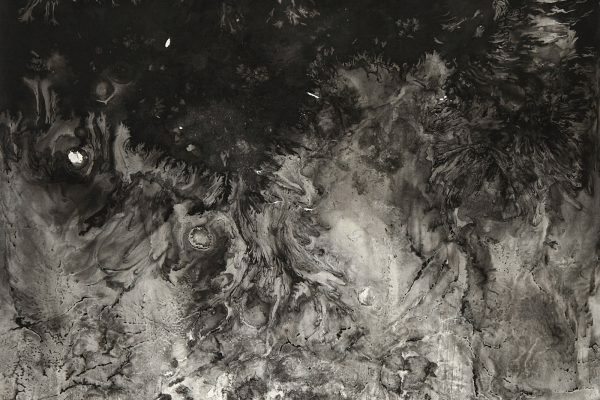 M. Sutherland Fine Art artists Chen Wenling and Yang Mian are currently in an incredible show in Venice, “Splendors of the Sun and Moon: Contemporary Art Exhibition of China” at the Museo Querini Stampalia Fondazione, Venice, Italy – through July 22nd. Yang Mian’s work you will remember from an exhibition of similar CMYK paintings from two years ago in New York. Chen Wenling has been shown by the gallery since almost from our inception. There is still time to catch this incredible show. Open through May 5th by appointment. 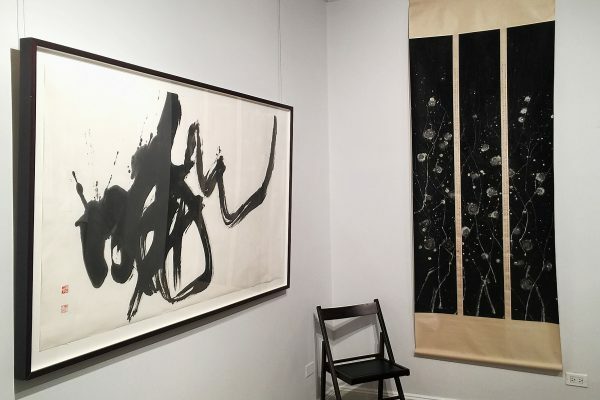 A show of abstract ink drawings by the contemporary Taiwanese calligrapher Huang I-Ming at M. Sutherland Fine Arts vividly demonstrates at large scale the unlimited textural and tonal possibilities of black ink on white paper. 7 East 74th Street, 3 fl. ; 212-249-0428; msutherland.com. 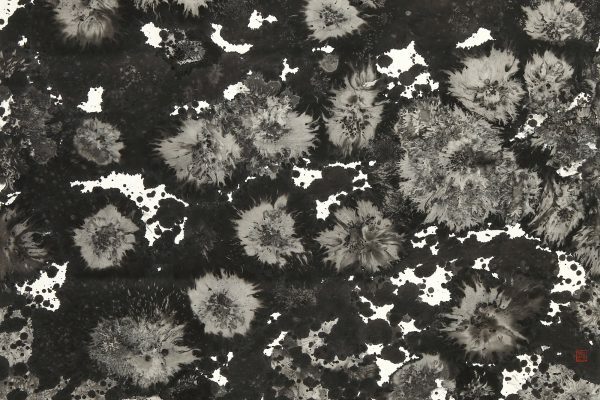 Please join us for our Huang I-Ming exhibition which opens today and runs through May 5th, by appointment. The gallery will be open regular hours during Asia Week New York, from 11am–5pm daily. 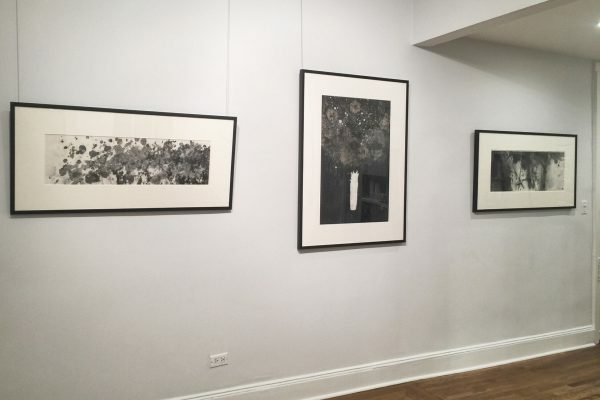 Our Opening Reception will be tomorrow evening, Friday the 16th, and we hope that you’ll drop by to celebrate with us and see this incredible selection of works on paper. The exhibition opens on Thursday, March 15th and runs through April 5th, by appointment. Huang I-ming (b.1952, I-lan, Taiwan) is an accomplished Chinese calligrapher based in Taiwan who also has taught and exhibited extensively in the PRC. Huang has practiced calligraphy his entire life, ever since he could hold a brush as a small child. Much like in the Ming and Qing Dynasties when scholar artists were first court officials and then retired to lives of creative contemplation, Huang, after a short political career, turned to practicing and teaching calligraphy full-time. Few modern calligraphers have full mastery of all script forms, but Huang is an outstanding exception. Huang’s oeuvre includes all calligraphic scripts, from Ancient Seal Script to Han Clerical Script, Regular, Running and Cursive scripts. Teaching at the Central Academy of Fine Arts (CAFA) in Beijing, Huang absorbed the creative excitement and vigor of the art scene there. He came away with renewed enthusiasm for a “modern” calligraphic style. For many years, calligraphy art has been my life. I have used every ounce of my being to create these lines. All the changes in these lines are produced with feelings and emotions. My frame of mind has evidently affected their creation, and they have, in return, brought me into a new realization and awareness of what is happening to the different environments, matters, and things surrounding me. This is a process of incessant cause and effect evolution………These lines have already become my entirety. What happens when wen yi becomes irrelevant to the creative act? The link between an actual symbol or word and brushwork is divorced and shu yi, “lyric aesthetic” becomes paramount. Huang credits the Japanese post –WWII calligrapher, Teshima Yukei of the Shosho group or “Shao Zi Pai” (or “Few Character Group), with promoting the first theoretical basis for separating wen yi from shu yi. To convey the utter despair and ruin of Japan in the late 1940’s and 1950s, Teshima believed that he could only do so by deconstructing and re-forming the written symbols of calligraphy. The resulting works allowed people who cannot read Chinese/Japanese kanji to grasp the intended wen yi or meaning of his visual perception. Inspired by this theoretical basis, Huang forged a new creative path, one where shu yi (expressive/lyrical nature of the brush) is transcendent, without specific reference to written language. 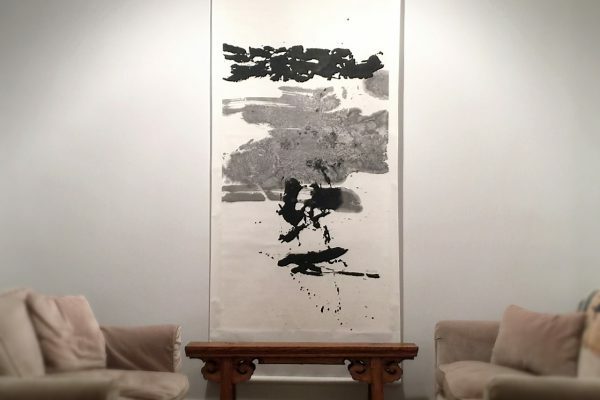 Huang describes his new work as “abstract expressionism with classical linearity” and is quick to remind that his works are not paintings per se, as the brushwork is firmly rooted in the framework of calligraphy brush traditions separate from classical ink painting. 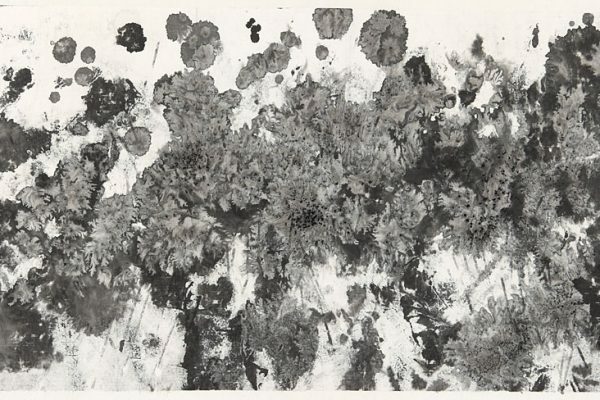 Further, Huang also gives credit to the influence of Western art on his style, specifically from the Abstract Expressionist painters of the second half of the 20th Century. The current exhibition will feature Huang’s breadth of style, from unwavering perfection of his small running script in “Autumn Stillness,’ to the mesmerizing abstraction, ”The Changes of Mother Earth.” The show will open for Asia Week (March 15- 24, 2018) and then continue through May 5 by appointment. 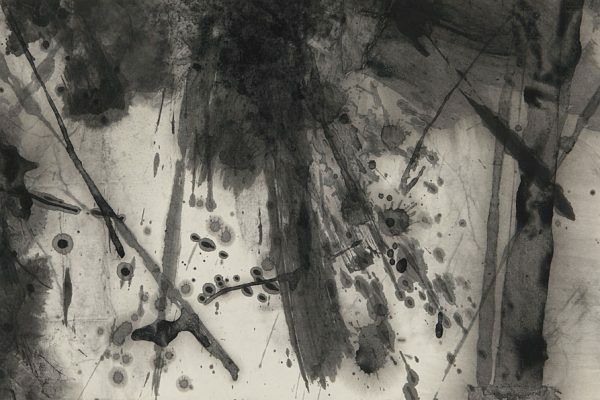 This is the third exhibition of Huang’s works at M. Sutherland Fine Arts.